UPDATE July 2015: New NREL data shows my projections were far to conservative. There is an extraordinary amount of capacity at capacity factor of 65%. Details HERE . 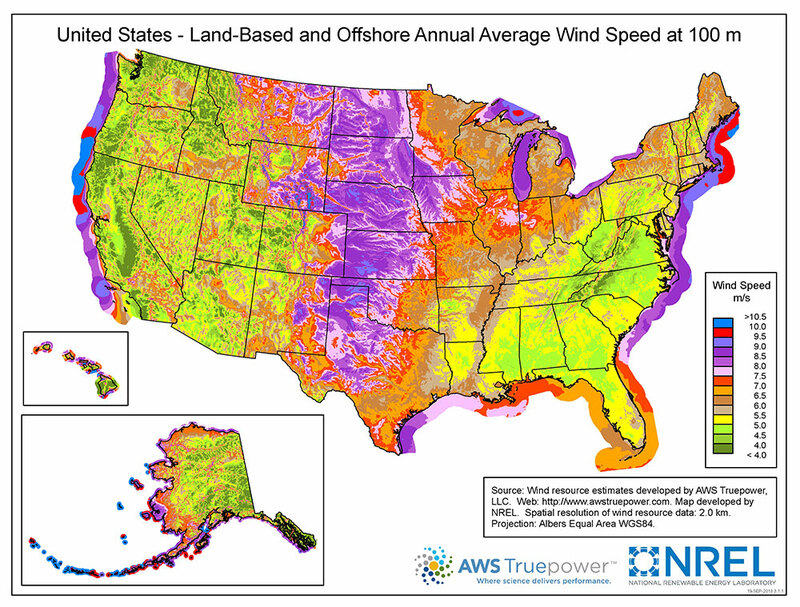 The best land based wind sites in the US are in Nebraska, Kansas and Texas. However, due to lack of transmission access these areas are not being exploited. 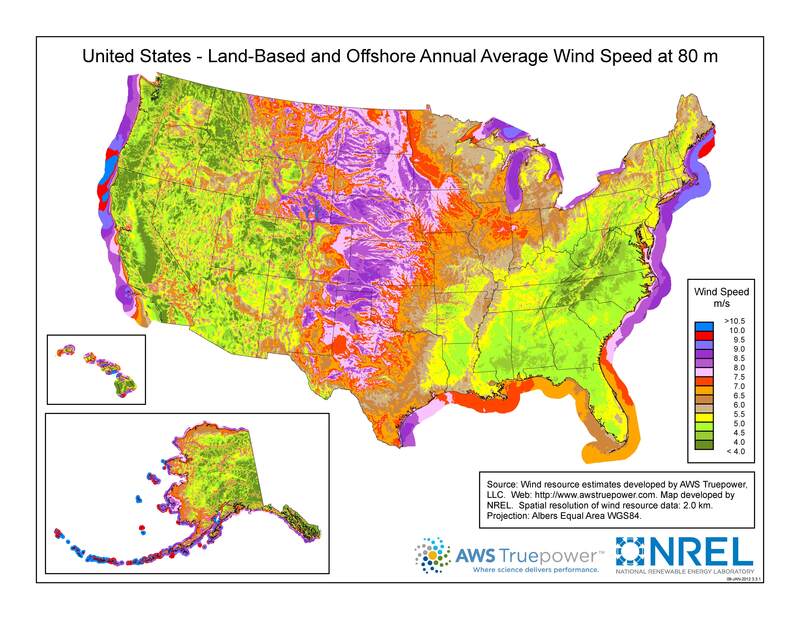 When NREL wind resource maps were updated from 80m hub heights to 100m hub heights it emerged that more than a terawatt of wind power is available at 50% and higher Capacity Factors (CFs). Additionally, these sites tend to be in geographically compact, flat rural areas. For significant deployments this dramatically improves the economics of nearly all aspects of wind farms from construction to maintenance to the building of transmission lines needed to aggregate the output of the turbines. Wind turbines now available with hub heights up to 140m while 100m towers are becoming the new standard. the case for building a High Voltage Direct Current (HVDC) supergrid to move wind power from the interior states to the East Coast has become overwhelmingly favorable. 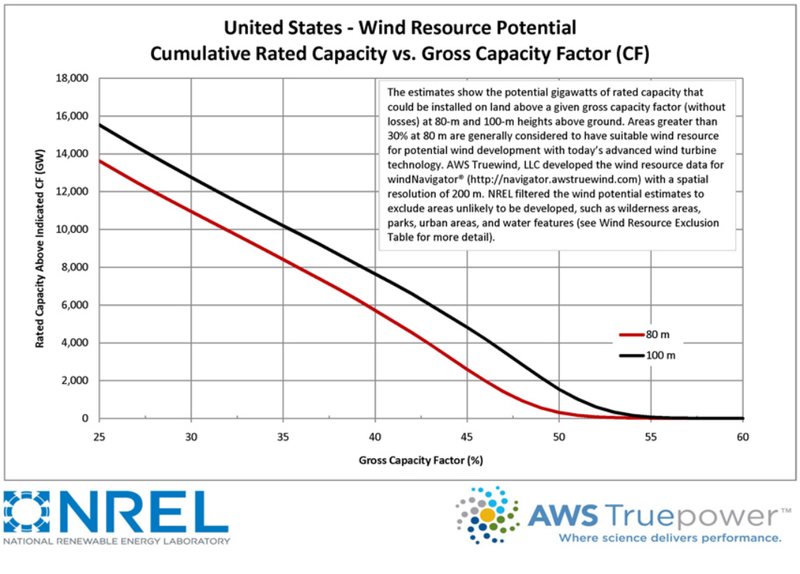 Figure 1: Wind resource available at 80m and 100m in the US. A few years ago, NREL published the Eastern Wind Inetegration and Transmission Study (EWITS) study. It currently serves as a foundational, highly influential work, driving a good deal of policy and business thinking in the wind industry. However, the 100m wind resource map had not been produced so much of the data used for EWITS is already out of date. Figure 2 shows the assumed distribution of CFs used in the EWITS study. Averaging these out for land based wind yeilds an average capacity factor only slightly higher than the current interior region’s fleet average CF of 37%. 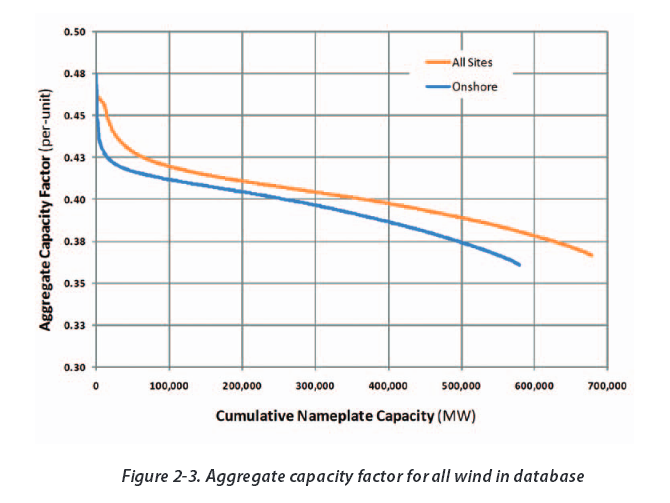 See pages 47 and 48 of DOE 2012 Wind Technologies Market Report (DOE2012MR). Figure 2: This figure shows the distribution of capacity factors used in the EWITS study. The majority of the capacity has CFs below 40% and only about 10GW is above 43%. EWITS was based upon the best available technology in 2009. Figure 3 below, from the DOE2012MR, shows that despite the 37% average, there are a number of sites that are in the 45% to 50% range. And this is with the very limited transmission resources available today limiting access to the best sites. 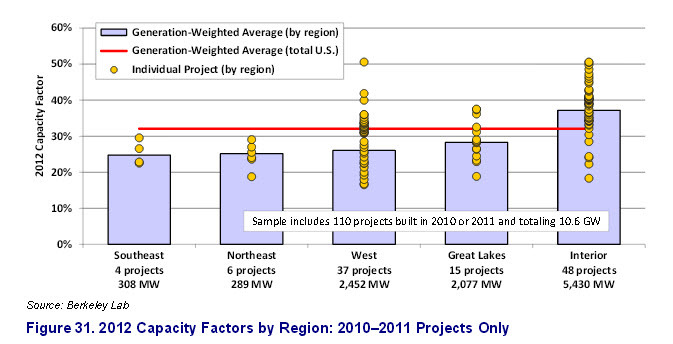 Figure 3: Capacity factor at sites across the country. The bar on the far right represents the average for wind turbines in the Great Plains states. In figure 4 it is apparent that through 2011, the hub height of turbines has pretty much stalled at 80 meters. Only very recently have the taller towers begun to make inroads. So it would appear that there are few optimally sited turbines with 100m or higher hub heights. This strongly suggests that the current average of 37% CF for the central region of the US can be substantially improved upon. Figure 4: Average hub height of wind turbines. 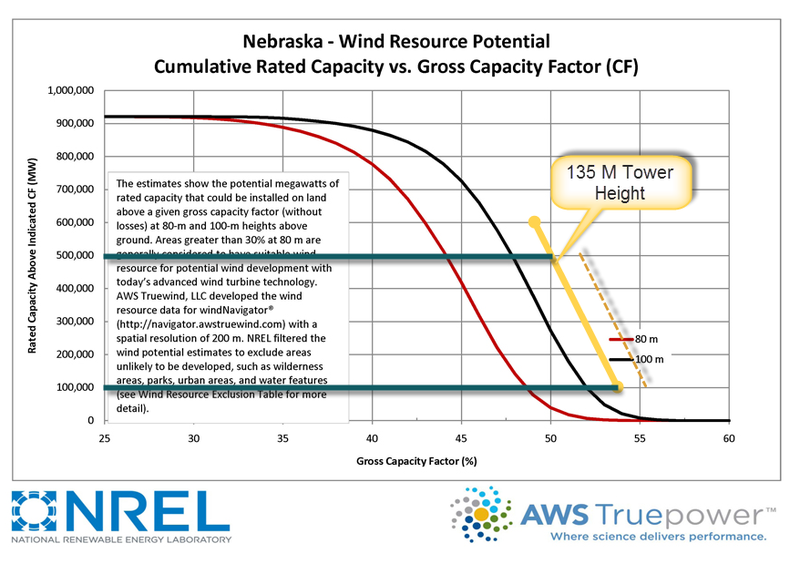 With the assumption of capacity factors less than 40% the EWITS study was relatively optimistic about the viability of a major build-out of wind with 20%-30% penetration (on an energy basis) being considered a stable addition. At 50% capacity factor the case becomes much stronger and higher penetrations could be accommodated. They propose using High Voltage Direct Current (HVDC) as the transmission method. HVDC is a highly efficient, inexpensive (compared to HVAC) approach to moving vast amounts of power over transcontinental distances using narrow transmission corridors. Figure 5: Image comparing the right-of-way widths of various transmission voltages. Be aware that 345kV is the primary work horse for bulk power transmission with 765kVAC being relatively new. Notice also that the 345 kV example is for 5GW where the lower row is for 6GW (about 7 typical nuclear power plants). 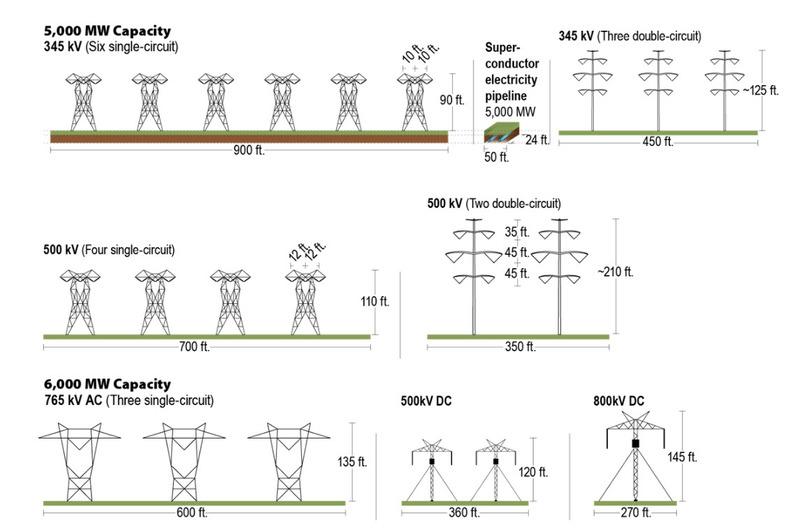 To be equivalent the 345kV right of way would need to be 200 feet wider. Kansas is second only to Texas in wind resource. In Figure 1 notice that at 80m hub height (red curve) there is negligible wind resource, with CF above 50%. But by raising the hub height another 20m (60 feet) nearly 250GW becomes available at and above 50% CF. That is more than the entire world wind capacity in 2011. Notice that at 52% CF there is roughly 100GW which is well above the entire installed fleet of wind turbines in the US. And this is just Kansas! A very similar situation exists in Nebraska, the 3rd windiest state, see Figure 5. And in both states the primary impediment to harnessing that wind is transmission access. These are rural agricultural areas that are highly symbiotic with wind. So the primary barrier is simply a way to get the power to the lucrative markets on the East coast. But the case becomes even more compelling. Figure 4: History of wind turbine heights showing the Enercon E-126 at 135 meter hub height farthest to the right. Not included in the EWITS database is the Enercon E-126 wind turbine. This behemoth is now in production, installed and operational. With a hub height of 135m it has the potential to take CFs to new levels. Some may point to difficulties or aspects of this turbine that are not ideal. For example, at one time they had an intellectual property dispute with the US preventing their import to this market. However, they have proven the feasibility of ultra-high towers. If it were decided tomorrow that we were going to run a high capacity HVDC power transmission line to Kansas or Nebraska, the wind industry would have a time window of 5 – 10 years to get models designed and built to optimally take advantage of the regions characteristics. Figure 5: Shows a conservative estimate for how the graph should be altered when using the 135m hub height of the Enercon E-126 wind turbine. I did a little bit of pro-am estimating to come up with some sense of the implications of 135m tower heights. In figure 5 I modified the NREL graph of CFs by adding an additional curve* to show what things would be like at 135m. I found that in Nebraska alone, there is 500GW at or above 50% CF. This has the annual energy equivalent of all of the US nuclear power plants combined! I then added a less conservative estimate, the beige line, and found that there may be over 100GW with 55% CF just in Nebraska! In conclusion, wind power at capacity factors above 50% forces the reexamination of a number of assumptions. The first being the capacity credit. Currently ISO’s typically assign capacity credits in the range from 8% to 19%. However that is based upon constrained transmission resources, limited geographic aggregation and much lower CFs. Both Kansas and Nebraska have relatively untapped, geographically dense, easy to build on regions where wind resources can provide wind power in the 50% – 55% CF range. This suggests that substantially higher capacity credits are warranted if turbines are built in this region. Further, transmission line utilization is much higher improving those economics. Finally, with higher capacity credits, less backup capacity is needed, reducing the costs associated with purchasing and maintaining backup. The findings of the EWITS study, that assumed aggregate CFs under 40%, were supportive of wind power and expanded grid infrastructure. The 100m data along with the ability of the industry to produce turbines with hub heights in excess of 100m provide a compelling case for a policy shift to place a high national priority on building out HVDC to premium central plains states. Given that the current average PPA rate for systems in this region is about $30 / MWhr, higher capacity factors would further lower this vary competitive rate sourced from carbon neutral wind power. *Methodology for modifying the NREL graph – I used the following assumptions. The jump from 80m – 100m is 25% while that from 100m to 135m is 35%. A reasonable estimate would be to shift the curve right by the same amount. However wind shear is a mathematically complex thing so I shifted it by half the distance to come up with the yellow line. I also wanted to look at the less conservative assumption and put the beige line in at a shift equivalent to that from 80m to 100m. This table shows the staggering wind potential in the US. This link takes you to a wind map like that above but with the added capability that you can click on the individual states to determine the available resources for that state. Each state has a detailed wind map and a graph showing the available resource at all CFs. This was released when NREL updated their wind speed estimates from 50m to 80m. In going from 80 to 100 the potential has increased again but to date I have not been able to locate a formal press release of the type here. This is a 2015 NREL report on how new wind turbine technology is opening up areas for development that previously were not economical. UPDATE: This map shows the wind resource at 120m, it is remarkable. This entry was posted in New Energy Paradigm, Path to a New Paradigm and tagged Remedy to Intermitency, Renewable Energy, United States, wind, Wind Energy, Wind Power. Bookmark the permalink. What about going higher and doing away with all the towers, concrete and steel? How about 70-90% CF and 1/4 the spacing at 1/20 the material? A 5GW windplant has been suggested to cost around 1.5B €. I wonder why there are so many people in Europe are working on that and almost non in the US where there would be much more space available. A 100MW pilot plant would not hurt anyone. Secondly, a question. Do your quoted wind CF numbers subtract planned outages from the denominator or are they using 8760 hours per year? The issue is that due to lack of transmission access and sticking closer to 80 meter hub heights we are missing out on considerable improvement in CF. The reason we are stalled at lower CF is because we are not building in the best sites and we are staying down at 80 m. If we go to 100m towers and build in the best sites we will see an increase in CF. Until then we will stall pretty much where we are. May be it’s time to update Wind turbine performance. The 8MW offshore turbine from MHI Vestas will operate with a capacity factor of more than 50% at the Dutch offshore wind farm of Borssele (wind farm fully operational in 2020). Dutch government said that next tenders will result in much lower prices ~€60/MWh, and indeed the Danish tender in September resulted in €63/Mwh. *) Prediction Dutch government. Present whole sale price here ~€35/MWh which will decrease towards German levels as we are increasing our interconnect with Germany. Whole sale pricing in Germany is in long term decline towards near ~€25/MWh, the cost price level of their new high efficient lignite plants (~45% vs 33% for the old plants) which are situated in the open lignite mine. Sorry but Dong offered to install, operate and decommission the wind farm for €7.27/MWh during 15years, thereafter whole sale. Not €72.30/MWh.